...The above tweet originated from the La Casa Blanca office, and was then re-tweeted from Jarrett’s own account as well. Within hours of the La Casa Blanca tweet, Jarrett was sharing her views on how wonderful Obamacare is for all Americans – including immigrants. Here's the other version of the postcard Jarrett didn't show Americans. Texico, here we come! You've been warned, Texas. Are you going to sit there and take this from the radical left? Or are you going to do something about it? Hopefully, the Court will rule in favor of the 26-27 states who have sued the DHA for the costly financial impact Obama's unconstitutional amnesty. Every American should be contacting their two Senators NOW and telling them that, to honor the oath they took to protect and defend the Constitution, they MUST VOTE YES ON HOUSE BILL 240 (the House's Bill defunding DHS's activities implementing Obama's unconstitutional amnesty. If they won't do it for the sake of Americans, they should do it for their children and their children's children. Freedom, once lost, is seldom ever recovered. We Texans were told that with the ten year influx of those liberals fleeing the bankrupt blue states, that we would be blue by 2014. What happened? In 2012, Mitt Romney took more votes than John McCain did in 2008, while Obama took fewer votes in 2012 than he did in 2008 and lost three traditionally blue counties. 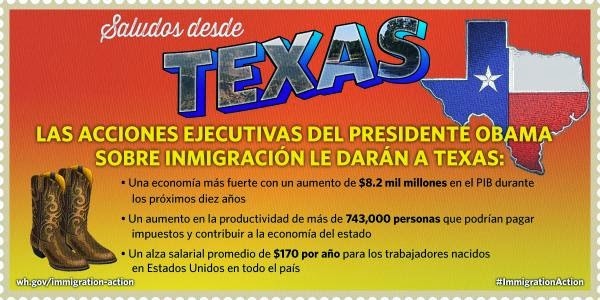 We currently have about 2 million illegals inside our state, but we have more Tejano (Texas born Hispanics) in our Congress than any other state. Our new first lady, Cecelia Abbott, is Hispanic and Greg Abbott, along with our Lt. Governor, Dan Patrick, took 44% of the Hispanic vote. Patrick took 50% of the male Hispanic vote. Do we need to worry? Of course, but when Obama sent his top-notch field campaign manager, Jeremy Bird, to run Battleground Texas and manage Wendy Davis' campaign, it is a clear sign that Texas Republicans are on top of the dirty tricksters. Bird is now the Obama guy who started V-15 in Israel to defeat Netanyahu. Let's hope his success there is as good as it was in Texas with Wendy Davis. Ms. Jarrett just might find out what "Don't Mess With Texas" actually means. We have more Tejano (Texas born Hispanics) REPUBLICANS in our state than any other state. Dear God, I hope you're right, Anonymous Texan, or the republic is truly screwed. As a Texan, methinks Ms Jarrett should be looking for a hole to climb into. Is not going to happen without.................. God Bless the United States of America and the Republic of Texas.